Thousands of volunteers and about 40 organizations participated in the 2019 MLK Day of Service which was held at the Bethesda North Marriott Hotel & Conference Center on Monday. “We have tons of service projects, volunteer fair tables for people to learn about volunteer opportunities throughout the County, so people can come in; we have over 2,500 from around the county,” said MLK Day of Service Project Manager, Melissa Jackson. Volunteers of all ages diligently worked on a variety of different projects. Rev. Deborah Johnson-Mosley volunteered to help create no-sew blankets and scarves for Montgomery Hospice patients. “I’m thankful for the opportunity to give back, and to do something other than sitting home, or thinking it’s not a special day. I remember when we fought hard for this day to happen and that’s one if the things I would like to do is give back,” said Johnson- Mosley. While another volunteer by the name of Davi Barreto, helped with food packaging to help benefit soup kitchens, food pantries, and emergency shelters across Montgomery County. “I’m very proud to participate in this, and volunteer for Dr. Martin Luther King Day because the food supports the child, and families,” said Barreto. Event officials say the turnout was amazing, and they are looking forward to doing this again for many years to come. 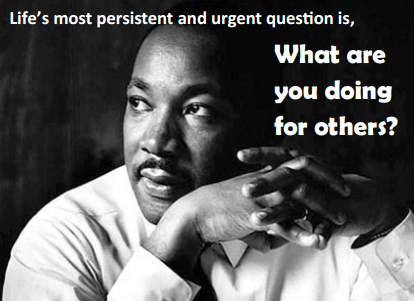 A famous quote by Dr. Martin Luther King Jr. reads “Life’s most persistent and urgent question is, what are you going to do for others?